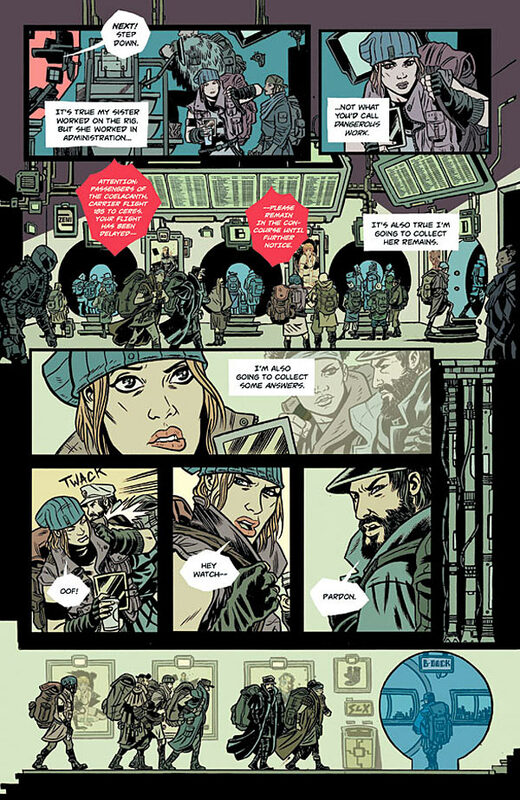 Southern Cross #1: Writer Becky Cloonan and artist Andy Belanger and colorist Lee Loughridge deliver the strongest debut of the year thus far in this sci-fi tale of spacefaring, potential murder and the guts of an amazing ship. Alex Braith journeys on the Southern Cross bound for Titan to collect the remains and belongings of her sister who recently died at a mining site there. Her cabin-mate happens to be investigating the death and the ship’s captain is more than happy to show her the ship’s impossible engine. the In 20-odd pages, Cloonan and her collaborators vividly put together a Solar System fully exploited for minerals and, seemingly, the difficult journey to get to those mining operations. But first, we get a tour of the ship and it utilizes comics’ peculiar relationship to page layouts in an exhilarating way. In spite of its fantastic look and design, the characters and atmosphere are quite familiar and I can’t wait to get to the next issue and see how Alex’s journey unfolds. Ei8ht #1: Raphael Albuquerque, artist of the infamous Batgirl cover, started his own title (with co-writer Mike Johnson)last month and it’s also a strong debut. Featuring time travel, it seems to suggest the characters are caught in some sort of soft place between then, later, now and now now. Using a very strong color scheme explained at the beginning, Albuquerque avoids intrusive captions to tell when scenes are happening in the story. Issue one also unfolds in complicated, scattered manner, but ends on a compelling cliffhanger that justifies the stories unstuck telling. Gotham Academy #6: Since this book is taking a two-months hiatus while DC moves to Burbank and has a Convergence cross-over event, I thought I’d take a look and see how this title has progressed. Boy! A lively mix of teen romance, junior detectives, familiar Gotham tropes and the sparkling character known as Maps, the series reached the end of its first storyline with the main characters, Olive Silverlock, Pomeline Fritch, Colton Rivera, Kyle Mizoguchi and Maps starting a detective club to further investigate the odd happenings at the school. Also, Olive finally stood up to the Batman, leading him to enroll his son Damian(!) at the Academy. I definitely look forward to seeing how he (doesn’t) play nice with the others. The art continues to impress, with a handful of amazing pages by Mingue Helen Chen in the most recent issue. Oh, and that maybe ghost hinted at in the early issues? It was Killer Croc, who promised to look after Olive after meeting her mother at Arkham Asylum. Southern Cross writer Becky Cloonan co-writes this title with Brenden Fletcher, so I guess this is her month here at Yay for Comics! Art from Gotham Academy #6. This entry was posted in Four Color and tagged andy belanger, becky cloonan, brenden fletcher, ei8ht, gotham academy, karl kerschel, lee loughridge, mike johnson, rafael alberquerque, southern cross. Bookmark the permalink.